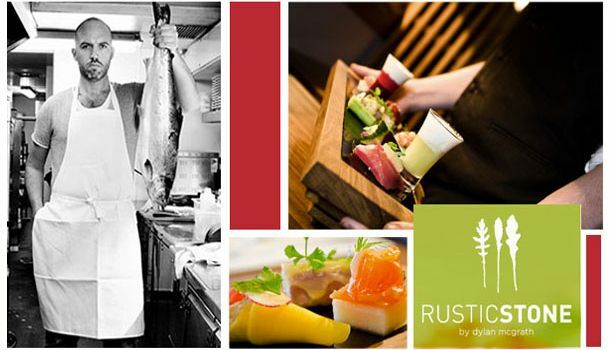 Treat yourself with a 2 Course Lunch for 2 with Tea/Coffee from Dylan McGrath at Rustic Stone for just €24! Award-winning Irish Masterchef judge Dylan McGrath is one of the most exciting chefs in Ireland. Today we are offering you the chance to try lunch at Rustic Stone which is bringing class to casual dining and is considered one of the best restaurants in Dublin. This offer is available 7 days per week and can be used up to the end of June. Native fish wrapped in nori seaweed cooked in rice bran oil brought together with crunchy vegetables and yoghurt. Beef rolls with green beans, mustard, rocket, tomato and tarragon served with a small mustard salad. Chunky basil pesto with marinated tomatoes, roughly chopped great black olives, pine nuts and parmesan. Served with a small pesto salad. Cooked in garlic cream with flaked chicken wing meat, parma ham and parsley breadcrumbs and little grape mustard on crutes. Floppy lettuce, baby gem leaves, watercress, torn iceberg, cucumber, pickled ginger, shaved mouli, slices of mango, coriander and watermelon dressed in lime roasted coconut, dill seed and lime.